Small businesses form the productive foundation of most mixed economies around the world. They provide an effective outlet for entrepreneurial initiative and ability, they fill market niches that are not profitable for larger firms, and they create jobs in a wide variety of occupations. The encouragement of small business growth has been a major concern of both governmental and non-governmental organizations in many developing countries. Cuba will face some special problems in developing its small business sector again after the transition. Some such issues will be made easier by studying the lessons of the transitions in Eastern Europe. Among these topics are the re-establishment of entrepreneurial incentives and rationalization of the price system. Other issues are particular to the Cuban experience. These include developing a small-business sector from a position of essentially no commercial small businesses and access to capital. This study attempts to outline the issues involved and to provide an initial analysis of the potential solutions to the problems. The paper first briefly describes small business operations in the United States to highlight their important role in job creation and market expansion. The conditions necessary for small business success are then contrasted with the actual birth and death rates of U. S. firms. Out of this comparison comes a picture of an extremely dynamic process. The paper next focuses on small business conditions in Belize, using available data from a variety of sources, to show that Belizean entrepreneurs face many of the same dynamic market conditions found in more developed countries. A description of the critical role played by key governmental and non-governmental organizations follows. Different market conditions and challenges facing Belizean entrepreneurs are then explained, along with their implications. The final section of the paper addresses the special problems that the Cuban economy will face as it begins to create a small-business sector in the transition. The required legal, social, and incentive structures are identified. In order to provide a foundation for considering Cuba’s small business sector, this section analyzes the world’s leading small business sector, that of the U.S. This discussion provides an introduction to the data available on small businesses, highlighting several of the data problems that exist even in the information-intensive American economy. One especially important concept is the volatility inherent in this segment of the economy, with individual firms entering and exiting the market with amazing frequency. This issue will prove to be daunting in the Cuban case. The reasons for failure of American small businesses are also exposited. Again, these topics will be of considerable importance to Cuba. Defining and Counting Small Businesses. A critical first step in analyzing small businesses is to define them so that they may be counted. Over the years, many different definitions have been used by Federal, state, and local governments in the United States. One widely-accepted current approach is that used by the Small Business Administration (SBA). The classification scheme developed by the SBA is used primarily for identifying small businesses which may be given preferential treatment in government procurement programs. Counting the number of businesses in a large, developed country is a rather daunting task. Probably the best indirect measure available in the United States is the number of income tax returns filed by business establishments. In 1992, 21.3 million business firms filed tax returns. Of this total, about 14,000 had 500 or more employees. The remaining firms, by definition, were small businesses. Out of the 21.3 million businesses, 5.7 million reported having employees. Almost 60 percent of these firms reported fewer than five employees; over 89 percent of the firms had fewer than 20 employees. A perhaps surprising corollary is that, in 1992, 15.6 million business concerns were single person firms, comprised of entrepreneurs working part-time or full-time in their chosen field. Another striking characteristic of the small business sector in the United States is its dynamic nature. Although the number of small firms with employees has been increasing since 1986 at an annual rate of about 2 percent, this net figure reflects substantial business birth and death rates. Typically, about 15 percent of all firms terminate or go out of business every year. At the same time, the number of new firms grows annually by about 15 percent. Another 2 to 3 percent of all firms, called “successor firms” are taken over by new or other existing firms. The 17 percent growth figure, minus the 15 percent termination figure, yields the net growth rate of 2 percent. Small businesses also tend to concentrate in specific industrial sectors in the United States. 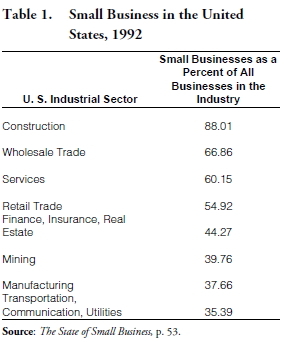 Table 1 shows the distribution of small businesses for 1992, ranked in declining order of concentration. As common sense would suggest, small businesses were most common in those sectors where a low capital-to-labor ratio is found, and where individual enterprise is most easily rewarded. Job Creation by Small Businesses. Small Business Success and Failure. Recognize your limitations, and stay within them. Keep enough records, but no more than necessary. Investigate first, not after. Don’t take pigs in pokes. Establish good relationships with suppliers and banks. A slightly different approach is used in the tabulation of business failures. For calendar year 1992, Dun and Bradstreet analyzed the demise of business firms to identify the proximate and primary causes of their failure. Obviously, the deeper, underlying causes listed previously are reflected in this tabulation. Table 2 presents the data. Some business failures understandably result from unforeseen market conditions or unfavorable changes in the economic environment. Most of the causes listed under the categories of neglect, fraud, experience, finance, and strategy are traceable, at least in part, to the lack of experience and ability of the businessperson. The clear implication is that additional training, education and experience would help businesspersons mitigate or avoid many of these terminal business conditions. The tenuous life of American small businesses is further emphasized by Dun and Bradstreet figures showing business failures by age of firm. Table 3 presents these observations for 1992. The figures show that, during the given year, almost 36 percent of all business firms that failed were no more than five years old. Two thirds of all failing firms were no more than ten years old. And many of those surviving the ten-year mark would fail before seeing fifteen years. A corollary of this record is that small businesses may create short-term jobs, unlike the jobs generated by a government bureaucracy or a large, oligopolistic manufacturing firm. Employees of small businesses (including the entrepreneurs) can therefore expect some job turnover during their working careers. All of these data suggest that the picture of a business sector dominated by large conglomerates is somewhat misleading. Although a handful of large corporations accounts for over 60 percent of the output of the U.S. economy, numerically these firms are dwarfed by small business concerns that occupy more specialized niches in the marketplace. Most of the business firms that are born every year in the United States are one-person operations, reflecting the will and the desire of an entrepreneur to produce a good or service that customers will appreciate and buy, thereby generating profit. The training, experience, and judgment of these entrepreneurs are critical to the survival and persistence of their firms, as the preceding Dun and Bradstreet data clearly show. Because a market economy permits, and even demands, risk-taking and experimentation, failure is also a normal part of business experience. It is a seeming paradox that, without business failure, there would probably be little business success. Both are by-products of the competitive market process. How well an economic system prepares its entrepreneurs for the critical decisions that must be made for firms such as these, helps to determine the growth path of the economy. Even with such extensive aid, many U. S. firms fail with great regularity, just as new firms are coming into existence to replace them. The Schumpeterian process of “creative destruction” thus lends variety, freshness, and change to the marketplace, and helps it adapt better to the needs of the consuming public. In order to understand the likely post-transition Cuban experiences with the development of its small business sector, it is useful to consider a reasonably well-functioning analog in another developing country. The choice here is Belize, a geographically small Central American country with a population of less than 200,000. Examining Belize is sensible in that the climates and crops of Belize and Cuba are largely similar. Belize also provides examples of both the potential positive and negative activities that can affect the small business sector. Defining and counting small businesses in Belize is more difficult than performing that task in the United States. National small business statistics have not been collected by the government, either routinely or periodically. In addition, the transitional segments of the economy, where entrepreneurs are moving their operations into the market system, are difficult to identify and measure. Casual empiricism, based upon extensive in-country travelling since 1981, suggests that a high percentage of Belizean business firms are individual proprietorships, managed and operated by their owners. These firms are lightly capitalized, and typically service local or regional markets. Periodic surveys of registered factories by the Belizean Labour Department provide the employment patterns reported in Table 4. These figures, although not comprehensive, provide a clear indication that the typical (or modal) Belizean factory is a small business. Factory categories include sawmills, sugar factories, distilleries, garment factories, bakeries, aerated water firms, machine shops, printing firms, fruit processing firms, corn mills, cigarette factories, ice plants, furniture shops, aluminum products firms, and flour mills. The details of the reports also suggest some changes in the pattern of factory employment over time. Corn mills appeared in double digits for all reported years. Bakeries also showed consistently high numbers. In contrast, garment factories increased from 1 to 7 over the period, reflecting one of the growth (and export-oriented) sectors of the economy. Auto repair firms constituted the largest segment of surveyed firms, accounting for 20.6 percent of the total. The latest available data show over 20,000 vehicles of all types registered in Belize, all of them imported, and most of them older models. Woodworking and furniture firms made up another 15.3 percent, reflecting the exploitation of Belize’s extensive forest resources. Ninety-one percent of all the surveyed firms were owned by men. The firms owned by women were concentrated in beauty care services, dressmaking, and food processing. 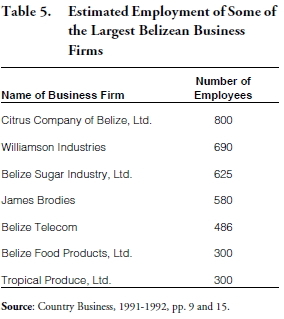 A less formal survey, presented in a commercial publication, lists some of the largest private employers in Belize, with figures derived from records of the Belize Chamber of Commerce and Industry and the Income Tax Department. The figures in Table 5 may be subject to considerable error, and hence are suggestive, rather than definitive. They also suggest an upper bound to the employment levels of Belizean firms. While other firms that employ several hundred workers may be identified, the clear implication of these figures is that there are no very large firms in Belize, measured by the standards that would be applied in countries such as Germany, Canada, or the United States. The business sector in Belize, according to all indications, is a small business sector, with all of the opportunities, strengths, and flaws of small businesses elsewhere. There probably is a relatively high turnover rate, especially among the smallest concerns in the country. Further concern was generated by the 1988 and 1990 Caribbean Basin Investment Surveys. Carried out by the U.S. Department of Commerce, the 1988 survey identified those firms in CBI countries that had invested in a new foreign exchange generating operation between January 1, 1984, and December 31, 1987. The 1990 update identified firms that had made such investment between January 1, 1988, and December 31, 1989. The 1988 data from Belize showed 34 firms that met the criteria. By 1990, half of those firms, representing 148 jobs and $28 million in assets, had gone out of business. An additional eight firms met the 1990 survey criteria. Total annual export sales for the reporting firms amounted to $6.2 million, based upon $30.5 million of assets, and a full-time work force of 976 persons.12 In short, this restricted sample of firms showed a fifty-percent mortality rate over a two-year period. The addition of eight more firms (a positive growth rate of almost 24 percent) fell far short of compensating for the loss. Tourism and the Hospitality Industry. Over the past decade, the flow of foreign tourists into Belize has approximately trebled, from about 67,000 per year to about 220,000 per year.14 As the data in Table 6 show, the business response to the growing flow of foreign tourists has been positive. From 1991 to 1994, according to Belize Tourist Board data, the number of hotel rooms in Belize rose by almost 36 percent, reflecting a net increase of 119 lodging establishments over the period. The strongest growth occurred in the cayes, in Cayo District, and in Stann Creek District, responding to a growing interest in ecotourism activities inland and the complex of diving and fishing activities around the barrier reef. Examination of the underlying details for Table 6 brings two important conclusions to the fore. First of all, the net increase in hotel rooms was accomplished by the process of “creative destruction” noted above. Some hotels went out of business, others came into being, while yet others either expanded or contracted. The process was very dynamic, even over a short time span. Table 7 details those changes. Secondly, many of the smaller hotel operators discovered that renting rooms will not cover all expenses. The hotel business, particularly for smaller operators, is seasonal. In an economy with a limited market and strong competition for tourist dollars, small hotel owners and operators therefore diversified their activities. Some introduced restaurants or eating facilities, that might also draw neighborhood customers. Others provided travel services, acted as guides, or sold souvenirs and crafts. In short, instead of specializing solely in the provision of lodging, they broadened their market appeal by engaging in other, related activities. This latter point is of special importance, since much anecdotal evidence suggests that Belizean small businesses often have so limited a market that they cannot provide a living for the entrepreneur who operates them. Instead, the entrepreneur must find other remunerative activities during the slack periods of the year. The Formal Sector/Informal Sector Dichotomy. At the lowest level (Level One) people do whatever they must do to subsist. They do not perceive themselves as entrepreneurs, nor do they conceive of their money-making activities as “business opportunities.” Activities are often ephemeral—selling chewing gum or cigarettes on a corner, or colas and sweets during parades. People at the next level (Level Two) have a fundamental understanding of business practices and have a viable going concern. They may make tortillas, or sew clothes . . ., or hawk an assortment of clothing or toys, or sell prepared food. Level Two entrepreneurs will invest whatever resources are available— be it capital, raw materials, skills, effort, time or ingenuity— into their businesses. The entrepreneurs at Level One are best helped by community assistance programs, that include not only support for the development of formal business enterprises, but also education, health, nutrition, and sanitation. In other words, these programs may address the entire life style of the entrepreneur, as part of an integrated community development effort. Level Two enterprises that are already generating income may be aided by a more focused approach, emphasizing the need for credit and technical assistance, and often setting up groups of like-interest businesspersons to exchange information and support. 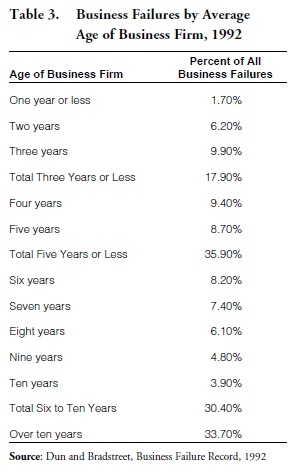 At Level Three, entrepreneurs are operating well-developed firms that can generally qualify for loans from established financial institutions, in spite of their small size.19 Ashe’s classifications roughly coincide with the formal/informal categories. Level Three firms would probably be classified as the formal sector, in spite of their small size, while Levels One and Two would correspond to the informal sector. These classification schemes not only provide an intellectually satisfying way of understanding small businesses, but they also emphasize the differing needs of small businesses at various stages of development. In the Belizean case, the evidence suggests a wide spectrum of small businesses, ranging from the ephemeral, one-person, seasonal retail or service activity at one extreme, to the well-established, well connected business firm at the other extreme. In Belize City, the nation’s capital, street vendors are ubiquitous in the downtown business district, coexisting and competing with the retail firms that line the streets. In the district towns, such as Punta Gorda or Belmopan, the same phenomenon in observed, especially on long-established “market days.” The vendors form a fluid group that is never the same from week to week. In order to meet the diverse set of needs posed by such a broad spectrum of entrepreneurial activity, either helping institutions must offer a broad variety of support activities, or there must be a broad group of complementary institutions, each offering some of the needed activities. Support for Small Business Growth in Belize. Belize has developed a complex of support organizations and agencies for small businesses, reflecting the wide range of entrepreneurial experience and developmental level shown by those firms. Entrepreneurs can receive training, financial support, and operational guidance, and are encouraged to do so by the Belizean government. The major financing and training agencies are described below. The Development Finance Corporation (DFC) is a government development bank (a “body corporate with limited liability established by the Development Finance Corporation Act, Chapter 226 of the Laws of Belize”).20 It provides technical assistance and financing for firms in agriculture, tourism, and manufacturing. In Belize, it has been in operation since 1973. As of 1992, the DFC had a capital base of about BZE$50 million, coming from a variety of sources, including the Caribbean Development Bank, the Commonwealth Development Corporation, the European Investment Bank, and USAID. From 1973 to 1992, the DFC has loaned BZE$123.8 million on 16,011 projects. The DFC has focussed on larger projects and larger loans. 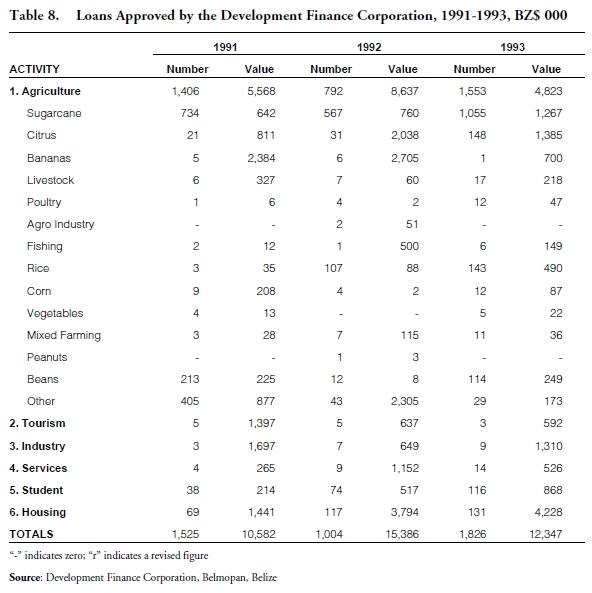 Almost 50 percent of the loans made during the 1973-1991 period were for BZE$50,000 or greater. The percentage was even higher in 1992. Nevertheless, small businesses have not been forgotten. Over 12,000 loans have been made with face amounts of BZE$5,000 or less. Another 1,409 loans were made for amounts ranging between BZE$5,001 and BZE$15,000. While these loans account for only 11 percent of the total dollars lent by the DFC, they have been of critical importance to the small business sector in Belize, particularly since the commercial banks in Belize normally extend trade credit, rather than longer-term loans for investment purposes. Table 8 highlights the wide distribution of DFC loans to Belizean firms, showing the importance of DFC funds to sugar cane producers, citrus producers, and other agricultural interests. In addition, housing and student loans have subsidized Belizean students studying abroad as well asBelizeans moving up to better housing.21 A complementary organization exists, however, that fills the need for assistance to the smaller firms in the economy. It has gradually developed a network of helping organizations, that tie together government agencies, trade organizations and cooperatives, and financing agencies. NDFB basically makes loans to entrepreneurs who do not have the resources to finance the beginning and operation of a small business. The organization also provides technical assistance, management training, and marketing assistance to entrepreneurs. From the point of view of NDFB, small business includes legal activities in the fields of farming, fishing, retailing, ecotourism, manufacture, and trade. Instead of defining small business specifically in terms of sales level or number of employees, NDFB uses the more pragmatic approach of itemizing the characteristics of small businesses, as follows: limited capital, assets, and employment; non-access to bank loans; family owned and managed; capable of providing low-cost employment to the owners and others. NDFB argues that small businesses produce more than fifty percent of the annual GDP in Belize. Several other organizations that focus on small business activity are closely related to the NDFB. The Small Business Association of Belize (SBA/BZE) is an organization composed of businesspersons who represent small or non-formal businesses. Most of the members are clients of NDFB. The organization was begun on June 10, 1992, as one of the initiatives coming from the CARICOM Regional Small Business Consultation held in Port of Spain, Trinidad and Tobago, on March 25-27, 1991. The SBA/BZE mobilizes the efforts of small business owners and operators to provide mutual support for business development. The group exerts political influence to support legislation, identifies credit sources, conducts or supports research studies on small business, refers members to appropriate helping agencies, and provides liaison with other NGO’s and agencies, including the Small Sector Development Council (SSDC) and the Confederation of Co-operatives and Credit Unions of Belize (CCC-B).24 Two specific programs targeted by SBA/BZE include Women Enterprise and Entrepreneurial Development (WEED), and Youth Enterprise Services (YES). Four government ministries also have representatives on the Board of directors of SSDC: the Ministry of Economic Development, the Ministry of Agriculture and Fisheries, the Ministry of Social Development, and the Ministry of Housing, Cooperatives, and Industry.25 The SSDC is a broad-based organization that tries to encourage intersectoral communication and growth, and to keep interest groups in contact with appropriate governmental agencies and ministries. the transition is that of the Eastern European economies. While this topic is too broad to consider in detail here some, the main problems are identified below. entrepreneurs to the underground economy, many small businesses operated profitably, and some even flourished, despite the Soviet-style economic regimes. Thus, for these countries, the transition has been merely a matter of adjusting to the increased market pressures, rational pricing structures, and decreased government interference in the business sector that accompanied the transition. Fortunately, a few options for improving access to capital are available for Cuba. First, Cuba does have the decided advantage of a huge pool of available capital in the hands of expatriates living in Miami. Presumably, much of this pool will return to Cuba once the “rules of the game” are clearly defined by the transition government. Unfortunately, the Eastern European experience also illustrates that transition governments often fail to understand the issues that are critical to a well-functioning market economy. Ambiguity in one such issue, property rights of current versus pre-Castro landowners, promises to be sticky. A resolution of ownership rights could easily extend for years, slowing the flow of capital into Cuba. There are several requirements for the existence of a strong, dynamic small business sector in a mixed economy. First, a well-defined, established set of property rights is essential for providing entrepreneurs the proper incentives to take risks. Rational pricing by market forces is also required. This will likely be the most important and daunting problem faced by Cuba in the transition. Conflicting claims by expatriates and non-expatriates could tie up courts and cast a long shadow of uncertainty over Cuba’s private sector for many years. A necessary condition for a successful small business sector is the resolution of these conflicts. every year. This Schumpeterian “creative destruction” is an essential part of a healthy economy, but it does create hardships. Cubans must fight the inevitable pessimism that business failures create. Third, the lack of practice at managerial and entrepreneurial skills will imply that Cubans will initially make unsophisticated, and inaccurate, decisions about starting small businesses. In this case, too, the only solution is time and experience. One bright spot is the ample supply of managerial and entrepreneurial experience just north of Cuban waters. These businesspeople will be able to substantially improve the business decisions made early in the transition. Native entrepreneurs will then be able to learn the required skills relatively quickly, especially as contrasted with the Eastern European experience. Fourth, availability of capital, both physical and human, will hurt Cuba in the initial stages of transition. Imprecise property rights will exacerbate this problem. However, there are two potential solutions: forfeiting activity by European banks and investment by Americans and Cuban-Americans. All things considered, small business is likely to be the backbone of the Cuban transition. Its success must be a top priority for the transition government. Although Cuba has been cursed with some unique problems, it is also blessed with potential solutions that have been unavailable to other transition economies. Given the nature of the Cuban people, it is likely that small business will succeed there. Ack, Anita. 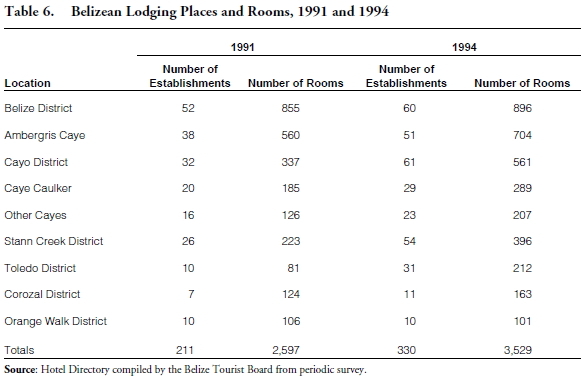 “Community-Based Tourism Initiatives in Belize.” Belize Today VIII:5 (May, 1994), 1416. Bauer, P. T. Economic Analysis and Policy in Underdeveloped Countries. Durham, N. C.: Duke University Press, 1957. Belize. Central Statistical Office. National Accounts Bulletin, 1980-1993. Belmopan: Government Printery, 1994. Belize. Export Processing Zone Act, 1990. Belize. Fiscal Incentives Act, 1990. Chapter 45 of the Laws of Belize, as revised. Belize. Information Service. Fact Sheet: Belize. Belmopan: Government Printery, 1994. Belize. Ministry of Economic Development. Abstract of Statistics: 1993. Belmopan: Government Printery, 1994.
. Belize Investment Guide. Belmopan: Government Printery, 1994.
. Investment Advantages and Opportunities for You in Belize. Pamphlet. No pace of publication, no date. Bghawat, Yatin. “Forfaiting: A Technique to Increase Trade Between NAFTA Countries.” Paper presented at “Economic and Financial Cycles and NAFTA: Issues and Analysis of Micro and Macroeconomics” symposium. Mexico City. June 7, 1995. Bromley, Ray, editor. Planning for small enterprises in Third World cities. Oxford: Pergamon Press, 1985. Coase, Ronald H. “The Nature of the Firm.” Economica 4 (November, 1937), 386-405. Country Business. Country Business, 1991-1992. San Ignacio: Country Business, 1992. Dun and Bradstreet Corporation. Business Failure Record. New York: Dun and Bradstreet, 1992. Delaney, William A. So You Want To Start A Business!. Englewood Cliffs, N. J.: Prentice-Hall, Inc., 1984. Development Finance Corporation (Belize). TwentyNinth Annual Report: 1992. Belmopan: Development Finance Corporation, 1992. Development: Mexico and Caribbean Countries. Boulder, Colo.: Westview Press, 1991. Jagannathan, N. Vijay. Informal Markets in Developing Countries. New York: Oxford University Press, 1987. McMorrow, Maura. “When You’re Hot, You’re Hot!” Belize Currents (Winter, 1989), 7-9. Meissner, Frank. Seeds of Change: Stories of IDB Innovation in Latin America. Washington, D. C.: Inter-American Development Bank, 1991. National Development Foundation of Belize. NDFB At a Glance. Pamphlet. Belize City: NDFB, no date. See, for example, Office of the President, The State of Small Business: A Report of the President, 1993 (Washington, C.: U. S. Government Printing Office, 1993), p. 295. The President’s Report is bound together with the Annual Report on Small Business and Competition and the Annual Report on Federal Procurement Preference Goals of the U. S. Small Business Administration. The data in this section come from The State of Small Business, pp. 36-37, and Small Business Administration, Handbook of Small Business Data: 1994 Edition (Washington, D. C.: U. S. Government Printing Office, 1994), pp. 36 and 62. See also Joseph A. Schumpeter, The Theory of Economic Development (Cambridge, : Harvard University Press, 1934), pp. 56-62 and Business Cycles (New York: McGraw-Hill Book Company, 1964), pp. 46-104. Handbook of Small Business Data: 1994 Edition , 1. Dun and Bradstreet, The Pitfalls in Managing A Small Business (New York: Dun and Bradstreet), 16. The Pitfalls in Managing A Small Business, 16-19. For a listing of small business resources, see, for example, Joseph Mancuso, Mancuso’s Small Business Resource Guide (New York: Prentice Hall, 1988), or Office of Management and Budget, Catalog of Federal Domestic Assistance (Washington, D. C.: U. S. Government Printing Office, 1994). The Belizean national currency, the Belize dollar, is denoted by the symbol, BZE$. Since 1974, the Belize dollar has enjoyed a fixed exchange rate of BZE$2.00 = US$1.00. Planning Innovations, Inc., Small-Scale Enterprises in Belize: A Survey. Part I, Report prepared under USAID Contract No. 5050000-C-00-8701 (Washington, D. C.: Planning Innovations, Inc., December, 1988), pp. E-1 to E-5. For vehicle registrations, see Ministry of Economic Development, Abstract of Statistics: 1993 (Belmopan: Government Printery, 1994), Table 4. See Belize Information Service, Fact Sheet: Belize (Belmopan: Government Printery, 1994), 7. See U. S. Department of Commerce, 1989 Guidebook: Caribbean Basin Initiative (Washington, D. C.: U. S. Government Printing Office, October, 1988), for a broad outline of the CBI program, and 1991 Guidebook: Caribbean Basin Initiative (Washington, D. C.: U. S. Government Printing Office, November, 1990), for details on the amended legislation. See 1991 Guidebook, 55-56, and U. S. Department of Commerce, 1990 Caribbean Basin Investment Survey (Washington, D. C.: U. S. Government Printing Office, February, 1991), pp. 16-17. Central Statistical Office, National Accounts Bulletin, 1980-1993 (Belmopan: Government Printery, 1994), 34-37. Because of large numbers of border crossings by returning Belizean nationals and short-term visitors from Guatemala and Mexico, the tourism data are See Central Statistical Office, Abstract of Statistics, 1993 (Belmopan: Government Printery, 1994), tourism/immigration tables. See Jan Breman, “A dualistic labour system? A critique of the ‘informal sector’ concept,” in Ray Bromley, ed., Planning for small enterprises in Third World cities (Oxford: Pergamon Press, 1985), p. 43. For a comprehensive discussion in the context of Indian society, see Vijay Jagannathan, Informal Markets in Developing Countries (New York: Oxford University Press, 1987), passim. Breman, “A dualistic labour system?”, 43-44. Breman, “A dualistic labour system?”, 53. Jeffrey Ashe, “Extending credit and technical assistance to the smallest enterprises,” in Ray Bromley, , Planning for small enterprises in Third World cities (Oxford: Pergamon Press, 1985), p. 279. Jeffrey Ashe, “Extending credit and technical assistance,” 279-280. United States Department of Commerce, Andean and Caribbean Basin Financing Directory (Washington, D. C.: U. S. Government Printing Office, October, 1992. ), p.
This section relies upon National Development Foundation of Belize, NDFB At A Glance (Belize City: NDFB, no date); NDFB, Ninth Annual General Meeting Report, 1991/1992 (Belize City: NDFB, 1993), passim; and an informational letter from NDFB to prospective supporters, dated February, 1994. Andean and Caribbean Basin Financing Directory, 97. Small Business Association of Belize, Agenda for the Development of Small Business in Belize, a report prepared by Michael Seepersaud (St. Lucia: Financial and Management Services, October 8, 1992). NDFB, The Non-Formal/Small Sector on the Move (Belize City: NDFB, no date). Belize Ministry of Economic Development, Belize Investment Guide (Belmopan: Government Printery, 1994), 1. For a complete discussion of forfaiting, see Yatin Bhagwat “Forfaiting: A Technique to Increase Trade Between NAFTA Countries.” Paper presented at “Economic and Financial Cycles and NAFTA: Issues and Analysis of Micro and Macroeconomics” symposium, Mexico City, June 7, 1995.